If you are short of time, the answers to the following 3 questions should let you know all you need to about the Sonicare DiamondClean electric toothbrush. If we have missed something, let us know in the comments. If you want more detail, you can read our full Sonicare DiamondClean review further down the page or watch our video review. Update July 2018: Since this review was published, Sonicare has launched the DiamondClean Classic, which we explain in more detail in this section. A stylish and minimalist design compliments this fantastic clean this brush offers. There are few things to complain about here and what complaints I have are silly niggles than big issues. Most won’t be disappointed, but those who like the idea of a connected toothbrush might be. The DiamondClean Smart is the newer and more capable brush. It commands a slight price premium, but that ‘extra’ is well worth paying for what you get. It is an enhanced and connected version of the DiamondClean — we rate it as the best electric toothbrush if money isn’t an issue. A cheaper alternative, that does lack some of the features of the DiamondClean, is the ProtectiveClean 6100. It is still a very capable brush with all the core things you need and would ask for of an electric toothbrush. 3. Where is the best place to buy the Sonicare DiamondClean? There is no one best place to buy the Philips Sonicare DiamondClean electric toothbrush. Shop around to find the best price and buy from a retailer you are happy to shop with — we have included a live price comparison below and it’s always worth checking out eBay too. We typically suggest Amazon as they are often very competitively priced and swift to deliver across the USA. With a price point at least $30 more than Oral-B’s flagship toothbrush the DiamondClean has to offer something special. For some time the DiamondClean was the flagship brush for Sonicare until they recently introduced the DiamondClean Smart. Despite this it is still a very capable and arguably commands the premium price, but it perhaps does not represent the best buy. There are a few different versions of the DiamondClean, so I want to clear a few things up. The DiamondClean and the Wireless Charging Edition are the same brush but with a different box contents. The DiamondClean Smart is an updated, more capable version of the DiamondClean with extra features and a different box contents. The DiamondClean Classic was a new version launched in mid-2018 — we have explained it in more detail below. Which version are we reviewing in this post? In this review I am looking at the ‘DiamondClean’. The box contents is the same, but the different colours has a knock on effect on the colour of the travel case and brush head supplied. The Wireless Charging Edition is essentially the same as the DiamondClean, but instead of coming with a premium travel case and charging glass it comes with a Qi charging plate and a deluxe travel case/pouch. Available in Black colour only, the charging plate charges the brush twice as quick as the charging glass and can also accommodate and charge Qi enabled smartphones. Examples include the Apple iPhone 8, Samsung Galaxy S6, S7 and S8. The wireless charging edition does not allow the brush to be charged in the case. The Classic is for the most part the same as the DiamondClean reviewed in this article, but there are a few slight differences. The newer DiamondClean Classic comes with a new premium travel case. Sadly, whilst this new case looks and feels a bit more premium the ability to charge the brush in the case is no longer offered. The DiamondClean Classic brush comes with just 1 x DiamondClean brush head included. The older model reviewed here, comes with 3 heads (1 x AdaptiveClean, 1 x DiamondClean and 1 x InterCare). The new model does come with a glass charging stand just like the older model, but it does too come with a smaller plastic attachment that fits to the charging base. When fitted it provides a smaller and more durable fitting option that takes up a little less space and holds the brush perfectly upright, rather at an angle as is required with the charging glass. The recommended retail price has dropped from $219.99 to $199.99. You can view the DiamondClean Classic here on Amazon. Here are what I consider to be the main plus and minus points for the Sonicare DiamondClean. Design – 5 different appealing colour options, this looks every bit as premium as it should for the price. Makes other brushes look dull. 5 cleaning modes – Whilst most generally stick to just one cleaning mode, ‘Clean’ this brush caters for different user needs with 5 useful and distinctly different modes. Brush heads – 3 different brush heads in the box which gives a bit more value to the whole package and helps make better use of the cleaning modes. Design – A few tactically placed grips would have been nice. Bluetooth – Not for everyone, but on a premium brush is it too great an omission? Travel case power connection – MiniUSB, the charging port of choice on the travel case is dated. At worst this should be MicroUSB or even the new and even more future proofed USB Type-C.
Pressure sensor – No way of alerting you if brushing too hard. Never would I suggest that styling is something that is forgotten about when it comes to creating an electric toothbrush, but from my experience a large proportion is about function, which is of course most important. I have criticised some brands like Colgate for producing well rather dull looking brushes. Functionally great but just a bit plain. Thankfully the DiamondClean brings the sparkle back. Quality has always been top notch from Sonicare and the DiamondClean continues that trend. The sleek and stylish handle fits comfortably in the hand and is available in 5 colour options. White, Black, Pink, Rose Gold or Amethyst, you decide what you like. Unlike the Oral-B Pro 7000 or Genius Pro 8000 where the Black coloured handle is contrasted by a White coloured brush head, here we have more appropriate coloured brush heads. White, Rose Gold and Pink handle come with White heads, whilst the Black and Amethyst come with Black. Much more aesthetically pleasing.. Smooth to the touch there are no lights or unsightly icons or buttons on the DiamondClean brush handle. In fact I would argue that Sonicare have almost gone too minimal. Whilst the handles have more of a matte finish to them, it would be nice to have a few more grips, even if it did affect the design slightly. It is not that the handle is particularly slippery, but there is not quite the same confidence when in hand as there might be with those handles with more rubber grips/contoured contact points. Towards the top of the brush handle on the front, is the Sonicare logo in a grey colour. Below this is the power button, which has a depression that the thumb fits comfortably into. It is not easy to accidentally press this, but does not take too much force to activate. You could argue this too is sort of a gripping point on the handle as the thumb falls into the concave shape of the button. There is a green power icon on the button to indicate that it is this, but that icon is not backlit. Under the power buttons are the names of the cleaning modes and the battery status icon. However these modes are really only visible when the brush is running. They are lit with a white light. With the power off you can hardly see these names in the handle at all. This setup adds to the minimalist design. Many other models have no way of distinguishing the cleaning mode at all or others have them printed on the handle, often with an accompanying LED for that mode. To access the different modes, you need to power on the brush and then press the power button again, possibly multiple times, to access the cleaning mode required. To use the Sensitive mode you would then need to press the power button once to turn it on. A second time to get to the White more and a third time to reach the Sensitive mode. I find this a bit of a faff. You have to remember how many presses you need as trying to manipulate the handle whilst in the mouth to see the icon and change the mode when the brush is powered on is awkward, even if you are in front of a mirror. Add to this is the fact that you can’t clearly see the list of modes on the handle until the brush is on. So, if I rarely switch to sensitive mode and I can’t remember what position it is, I need to power the brush on to get it to light up and potentially cycle through the modes to find the right one, before turning it off and running through the process again this time in my mouth with toothpaste on the brush head. This whole debacle is perhaps worsened, if like many, you share a brush handle with a partner for example. You constantly need to check and maybe cycle through the modes. It is a bit of a sticky situation because the variety of modes make the brush more appealing to share between users but also makes it more awkward potentially. In fairness to Sonicare, most of us don’t change modes all that often and the brush will remember the last cleaning mode used, if the brush automatically powers off at the end of the cleaning cycle. So next time you power on the same mode will be selected. But, a separate button to change the mode would be nice, particularly if it can be done prior to turning the brush on. A $30 no name electric toothbrush manufactured in China offers this! As it happens, this has been solved with the DiamondClean Smart. The DiamondClean can actually deliver up to 62,000 brush movements per minute to the teeth. Try doing that manually! Here is a bit more detail on each of the 5 cleaning modes. We cover them more thoroughly in our post Sonicare Brushing Modes Explained. Deep Clean – Provides an invigorating deep massage to deliver an exceptionally clean experience. Lasts for 3 minutes. Below the cleaning mode icons on the brush handle is that of the battery indicator that usually lights up Green, but will flash Yellow if the remaining power is particularly low. Built into the brush handle itself, the non removable battery offers up to 3 weeks battery life, but more on that later. On the base of the brush is a silver plate. This is the inductive charging panel. There is no recess for a prong to charge the brush, like there are with many other models. Just sit this brush in the charging glass provided or in the case and the charge is transferred through this plate. At the very top of the brush handle is the metal prong to which the interchangeable brush heads attach. The motor inside the brush handle feeds the power and sonic movements through this piece of metal up inside the brush head which in turn moves the bristles to clean the teeth and gums. Personally, I prefer the clean offered by Oral-B brushes, it is not quite as soft as Sonicare. Studies have shown both to be very effective, particularly if you are moving from a manual brush. The DiamondClean will give significant improvements to your oral health, removing more plaque and bacteria and making your teeth and gums healthier. Provided in the box are 3 different styles of brush head. These are of course essential to the process of brushing your teeth. Therese are just some of a larger range of different brush head styles that can be used on Sonicare brushes. The different styles of heads can be purchased separately in different pack sizes and different colours to match in with your brush. The heads are easily replaced, pull off and push on. Remember to change them every 3 months, sooner if the bristles are worn of the reminder bristles have faded. Not familiar with reminder bristles? Blue coloured bristles which over a typical 3 month period will fade from a relatively strong Blue to White colour. If they turn white, replace the head. What is perhaps misunderstood by many, as it is not always that well explained is that using an electric toothbrush requires a different technique to cleaning the teeth compared to a manual one. The Sonicare instruction book included in the box does explain this pretty well. Therefore, if you decide the DiamondClean is for you, be sure to consult the manual and learn the right way to brush. This is as important as the brush itself and often something not known by those moving to an electric toothbrush. With first time users in mind, ‘Easy-start’ helps ease you into using an electric toothbrush. The Easy-start feature gradually increases the sonic power over the first 14 brushing sessions. As you will have seen the shortest cleaning mode available on this brush is 2 minutes in length. 2 minutes is the minimum recommended time for brushing your teeth. You should do this twice a day. Preferably morning and night. Despite 2 minutes being a relatively short period of time, few do clean for that long and to help you ensure you do Sonicare have built into the handle a timer and quadpacer. 4 quadrant to the mouth they are, top right, top left, bottom right and bottom left. If each are given 30 seconds attention, it results in the brush at 2 minutes, automatically turning itself off and your mouth hopefully fresh and clean. 2 features that are in my opinion missing, are a pressure sensor and Bluetooth connectivity. As the name implies a sensor detect if too much pressure is applied during cleaning. As a consequence a light is illuminated to alert you. You can then reduce this so as not to do damage to the teeth. Now the second feature I believe they are missing is Bluetooth connectivity. It can be argued quite convincingly that this is a gimmick and not needed, but what’s the harm in including it? Its use then becomes optional. If you have missed this whole Bluetooth in a toothbrush thing then allow me to briefly explain. Some brush handles include this and via an app available from the relevant app stores, your smartphone communicates with the brush. It can show you in real time, cleaning time, mode and performance and then logs this for future reference. For years we have done without the need for such, but as millennials adopt electric toothbrushes this is a logical addition. Sonicare have actually overall probably done a better job of implementing it that Oral-B have, yet Oral-B have built it into a lot more models than Philips. Given this brush is competing with the Genius Pro 8000 it is an omission that will favour Oral-B. BUT, 2017 has seen the introduction of the DiamondClean Smart that addresses both of these issues. This model is however still hampered by the lack of such. With 21 days of battery life, this slim profiled brush handle is really quite impressive. Provided are two different charging solutions. The first is a glass charging stand and the other is a travel case. I explain more about each of these in the ‘Battery’ section of the review below. A neat addition, I particularly like the travel case. A very rigid case, it is hinged on the longer edge with a soft touch material coating over the harder inner shell. This provides excellent protection to the brush handle and up to 2 brush heads. It looks smarts and is one of the best cases I have seen and handled. It is not small, but then again you do not expect it to be. The case closes magnetically too, which is a nice touch. It is easy to open again, the magnets are not too strong! The brush can be charged in the case which is great and it can be connected to mains power or a USB socket on your computer. It is a shame unlike a smartphone Sonicare stuck with a dated connector, more on that below too. Some users share a brush handle with family members or a partner for convenience and to extend the value. Given the various cleaning modes and specialised heads, it would be nice to include or have available some form of brush head storage compartment to allow storage. Third party options do exist but brands like Oral-B include such as standard. So, overall it is pretty good going for the DiamondClean, a few negatives but most important is the clean offered and it does well here. Just how much battery life you need in an electric toothbrush is a question there is no right or wrong answer too. Many feel battery life is not all that important, whilst others do. In fact our survey of over 1000 readers found that just 17% felt long battery life to be important, other factors were rated higher. Personally, I really like the idea of an electric toothbrush that can last 2 weeks, the sort of time period I might go away on a vacation for, without needing to take the charger. However, many others think the battery life can be short as more often than not the brush is left on or near to its charging stand when not in use anyway. Either way, if the brush has a good battery life that has to be a bonus right? Well the DiamondClean delivers a bonus and then some with over 3 weeks life from the built in Lithium-Ion battery. The battery is not user removable and when having been charged fully you can get 84 minutes of brushing time from it. This is based on 1 user brushing their teeth twice a day for 2 minutes each time on the standard ‘Clean’ mode. I cannot fault this at all. Even the best Oral-B models currently last 12 days, the DiamondClean is offering basically double this, without doubling the size of the brush handle. In part what does help is the automatic power off facility. It might be small but I think it helps eek out those extra few minutes life from the battery. Some modes like deep clean last longer and thus consume more power and will reduce the usage time At worst 2 weeks battery life is to be expected. That is still a couple of days better than Oral-B brushes. In the instances where you do need to charge the brush you have 2 options. Supplied is a glass charging stand and a travel case that allows the brush to be charged whilst inside. The charging glass is made up of 2 pieces. A plastic plate that the power cord is wired into and the glass that sits on top. The plate sits on a worktop and connects to a 2 pin US mains socket, but does have support for 100-220v, meaning it is perfectly possible to take this with you travelling, but you might need a plug adapter. Not plastic, the actual glass that sits on the top is a chunky and weighty piece that looks much like a glass you may have a slow/stiff drink from. 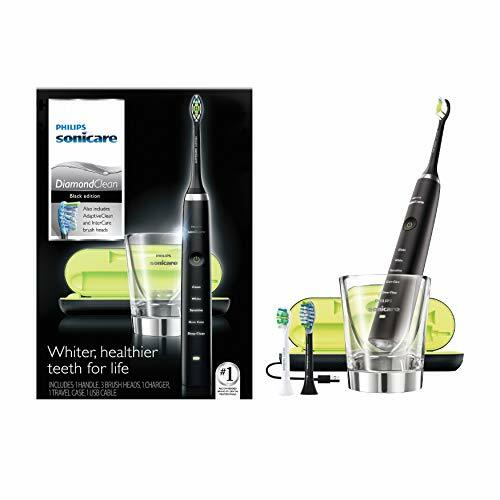 Branded with the Sonicare logo, the brush sits at a slight angle in the glass and not upright like you might expect. Despite no charging prong fitting into the base of the brush, it still manages to charge the brush though, it does so wirelessly. Without doubt it looks stylish and fits in with the aesthetics of the DiamondClean brush itself. The whole setup does take up a bit of space though on a worktop. Taking up to 24 hours to charge the brush fully, if you battery is low and you want a quick top up, you are going to need to leave it for 30-60 minutes really to give a bit of change in the handle. One of the more novel and desirable elements to this brush is the premium travel case that allows the brush to be charged inside it. This is great for those that travel frequently as you don’t need to take the charging glass. The battery icon on the brush handle will flash Green until fully charged. A rapid Yellow flashing icon indicates that the battery is low and that you have fewer than 3 uses left. Until the DiamondClean Smart came along, this was for a long time the most premium and expensive Sonicare model. The suggested retail price is $220 and even with the new model available, the average selling price remains relatively stable at $180-190 — we have included a live price comparison here. It is certainly ‘about right’ based on the price of Sonicare’s cheaper and less feature rich models. However, the Genius Pro 8000 from Oral-B is at least $30 cheaper and offers technically more, making the current selling price is a bit of a bitter pill to swallow. Sonicare do and always have commanded a bit of a premium. Rarely are their brushes designed to be the cheapest; and on handling and using them you often realise why. It is the small touches that make Sonicare brushes more appealing and perhaps more enjoyable to use long term. But, when many of us consider a toothbrush, even an electric one to be more of a necessary purchase than a luxury one, do the better looks and more impressive charging case really justify the spend? With the typical life of an electric brush being 3-5 years, here at Electric Teeth we price them over this period to work out an approximate cost of ownership. The DiamondClean works out at approximately $278 or $0.25 per day to own. At $8 per replacement brush head these too are more expensive than the competition. The Oral-B Genius Pro 8000 is about $0.20 per day or $215. To get extra value from the brush, particularly the DiamondClean without Bluetooth would be to share the handle (change the brush heads) with a partner or someone else in the same home as you. This way you reduce the overall cost, but retain the benefits. Whilst I wish not to focus on the new DiamondClean Smart, compared to the DiamondClean I think it is probably the better buy overall. It works out at $308 to own or $0.28 per day, so a little more expensive but you do gain a little more. It addresses what I believe are a couple of the DiamondClean shortcomings, and what’s an extra $20 when spending this much? Make sure you get the 9500 Series DiamondClean Smart, don’t get he 9300. Minor but important differences. Price and what I perceive to be good value will be different to you. All things considered pay a price you are happy to pay. Tried and tested are Sonicare products, the DiamondClean is made to some of the highest standards and the feedback we receive is generally very positive. Being an electrical product with moving parts there will inevitably be the chance of some units falling, but should this happen you are backed by a 2 year warranty. We go hands on with all brushes we test and the DiamondClean is no exception. There are no immediate cause for concern in what we have seen and experienced with this brush. It looks and feels solid and generally well built and have being using it as a daily brush within our team for well over a year with no issues to report. If there was one thing to really pick up on it is the detachable MicroUSB cable that is used to charge the brush in the case. It is easy to lose because you don’t need it all that frequently. On the other hand, it is a common cable type and could be easily replaced if required. Do be aware that the Sonicare DiamondClean is water resistant so it can get wet and be wiped down with water but it is not waterproof so where possible avoid prolonged exposure to water to avoid doing damage. Philips explicitly state in the user manual that it should not be used in the shower or bath. Perhaps more caution than anything, but best not test it! The likelihood of the DiamondClean being a bad brush with lots of flaws were very very small. There really are few criticisms that I have over this brush and what it offers. It cleans well, it offers a good battery life and a pretty decent box contents including a travel case that allows the brush to be charged inside it. However, the DiamondClean does lack when it comes to connectivity options that Oral-B’s equivalent offers, for a lesser price. But, Sonicare have a new model out, the DiamondClean Smart that addresses this lack of connectivity and builds the charging cable into the case rather than it being detachable. Based on the current pricing, a few extra dollars spent on the newer DiamondClean Smart 9500 model is well worth it, trust me on that. It is not all about connectivity, and for some this might be a feature too far. If Bluetooth is not important to you but quality and options are then take a look at the 6100. Is the Sonicare DiamondClean an oscillating brush? How many brushing modes does the Sonicare DiamondClean have? This brush offers 5 different cleaning modes. Press the power button to switch the brush on, then again to be taken to the next cleaning modes available. The DiamondClean comes provided with one AdaptiveClean, DiamondClean and InterCare brush head. Sonicare do have a range of alternative brush heads that are compatible including, ProResults, ProResults Gum Health, Sensitive and Sensitive that can be purchased as alternatives to those included in the box. Does the Sonicare DiamondClean have Bluetooth? Does the Sonicare DiamondClean have sound connectivity? Does the Sonicare DiamondClean come with a warranty & how long is it? Does the DiamondClean have a built in timer? Can I use the Sonicare DiamondClean in the shower? Yes. The DiamondClean comes with a hard travel case that holds the brush and up to 2 brush heads. Do you own or have you used the Philips Sonicare DiamondClean?